Review: Dennis Hopper as remembered by his right hand man in "Along for the Ride"
He outlived James Dean, held his own against John Wayne, and with Jack Nicholson created the pinnacle of 1960s independent film, "Easy Rider." Dennis Hopper was a maverick, a multi-hyphenate of a most illustrious sort: actor-writer-director-photographer-carouser. Following "Easy Rider," he could write his own ticket in Hollywood, and did so, grabbing $1 million and final cut from Universal to film "The Last Movie" in the mountains of Peru. The resulting film may have been art, depending upon whom you asked, but the studio was determined it was not commerce, and buried it. Blacklisted by the studios, Hopper became a pariah, though a legendary one. He maintained a bohemian existence in Taos, N.M., in the years before he overcame his alcoholism and revived his career with the films "Apocalypse Now," "Out of the Blue," "Blue Velvet," "Hoosiers" (for which he earned his sole acting Oscar nomination), and "Speed." Instrumental to Hopper's survival was his right-hand man, Satya de la Manitou, whom he met at the time of "Last Movie" and whose friendship and service over decades helped maintain the allure, and the life, of the star, not least of which when he shanghaied the actor off to rehab. 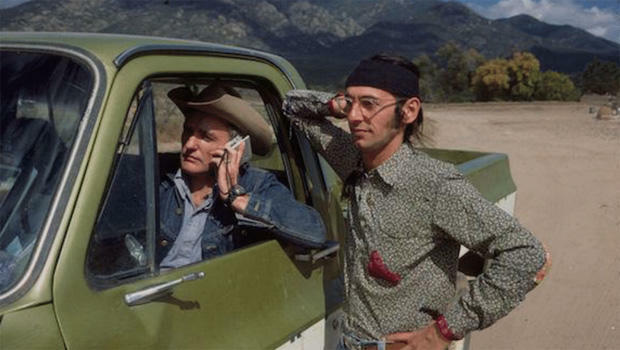 Directed by Nick Ebeling (whose run-in with Hopper at a tender age sent him running to consume the actor's oeuvre with gusto), the documentary features invigorating remembrances from many who were pulled into Hopper's orbit during the 1970s and '80s, including directors Wim Wenders and David Lynch, actors Dean Stockwell, Russ Tamblyn and Linda Manz, studio exec Michael Medavoy, musician Dwight Yoakam, architect Frank Gehry, and artists Ed Ruscha and Tony Shafrazi. De la Manitou binds it together, rummaging through storage units and scrapbooks, the bleakly beautiful landscape of Taos, and the Peruvian locations of "The Last Movie," which refuse to change from how they looked almost five decades ago, when Hopper brought the artifice of cinema for a story about the artifice of cinema. The movie's soundtrack is smothered at times by a score from Gemma Thompson (of Savages), but the crisp, black-and-white cinematography by Ebeling, Danny Reams and Randy Wedick, rare photographs, and snippets of Super 8mm footage taken on the locations of both movies and soirees, pull you right into the period. The film is a black-and-white contact sheet of a movie -- nostalgic fragments in time lovingly preserved and highlighted by grease pencils, used to illuminate a portrait that is nonetheless too big to be contained in any single account, no matter how devotional. "Along For the Ride" (distributed by Significant Productions and Hat & Beard Films) opens November 3 at the Metrograph, New York City (along with a retrospective of films directed by the actor, screened in 35mm), and in Los Angeles December 8. To watch a trailer for "Along For the Ride" click on the video player below.